Many birders got their first personal interactions with wild birds by feeding ducks at local parks or urban ponds. Knowing what to feed ducks can help provide the birds with a healthy diet so future generations can enjoy this activity safely both for themselves and for the birds they want to feed. Feeding ducks, geese, swans, and other waterfowl is a topic of great debate among birders, conservationists, and city officials. There are many bird feeding myths related to ducks, including the idea that feeding the birds will stop their migration. In fact, many waterfowl species are naturally year-round residents of city parks and similar habitats, and they will remain there whether or not they are hand fed. Too much feeding, however, is unhealthy and can create excess waste and pollution that can destroy habitats, while leftover, uneaten food can attract rodents, create unpleasant odors, and spread diseases. Birds that are fed too often can also become aggressive and may become a nuisance if they overpopulate a small area. It is important to realize that waterfowl are capable of fending for themselves and do not require human handouts to survive, no matter what the season nor how much they seem to beg for treats. Anyone who does want to feed the ducks, however, can do so by offering nutritious treats to supplement the birds’ wild diet. 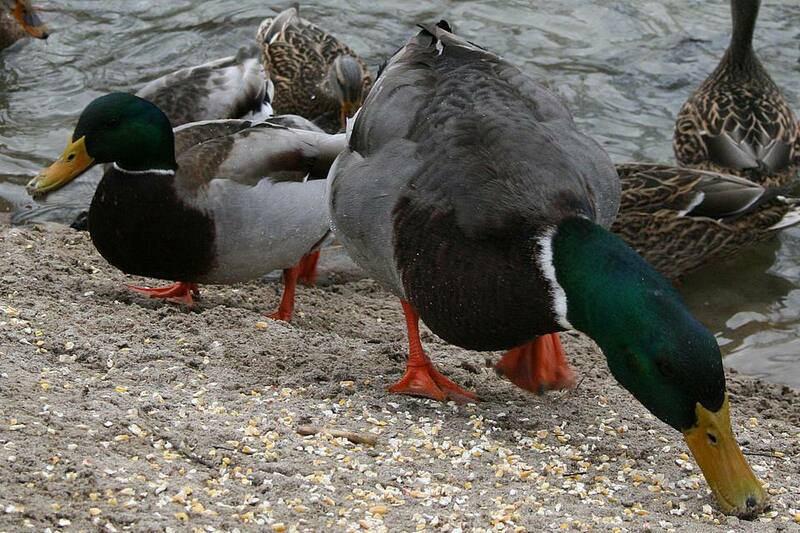 The most common items fed to ducks and waterfowl are also the least nutritious and most unhealthy. Bread, chips, crackers, donuts, cereal, popcorn, and similar bread-type products and junk food scraps are never best to feed birds. Feeding ducks bread is bad because the food has little nutritional value and can harm ducklings’ growth, pollute waterways, and attract rodents and other pests. Similarly, ducks should not be fed any products that are spoiled or moldy, since different types of mold can be fatal to waterfowl. Fortunately, there are many other foods that can be offered to ducks, geese, and swans as part of a healthy, safe, and nutritious diet. Duck feed pellets or poultry starter pellets are another great option, and they can be purchased from farming or agricultural supply stores. These types of pellets are the same food that some parks may offer in coin-operated vending machines so visitors can easily feed ducks a healthy, nutritious treat. Stop feeding if the birds appear uninterested or are leaving the food uneaten, since leftover food can quickly rot and attract unwanted pests. Avoid feeding the ducks if other visitors are already offering treats, as too much food can lead to health problems and uneaten leftovers. No matter what foods you provide, only offer foods in bite-sized pieces the birds can easily consume without choking or struggling, since ducks do not chew. Litter can hurt birds in many ways, so be sure to dispose of all trash properly, including bags, twist ties, plastic clips, and any unsuitable or moldy scraps. Feeding ducks, geese, and swans at local ponds and parks can be controversial, but it can also be an enchanting wildlife experience for all ages, and more than one birder has become interested in birds because of feeding ducks. By knowing what to feed ducks as part of a nutritious and responsible diet, birders can enjoy this activity without inadvertently harming their favorite waterfowl.